Christoph Birkholz is from Switzerland and a graduate from INSEAD Business School. He carries out consultancy assignments for big firms such as Swisscom, Google, Axa, Crédit Suisse and the Swiss retailer Migros. With his team, he guides large organizations like the above through digital transformation and new product development. These companies also pay well: each assignment brings in between 800k and 1.5m CAD (620k-1.16m USD) per year, per company. Filipino Ces Rondario also does assignments for big firms. She works for Citibank, among others. Her specialty is design thinking; an innovative approach whereby Ces puts herself in the shoes of the client: she creates the products or services with the clients. Joao Vitor Caires, from Brazil, has developed immersive training courses for managers in big companies in his country. For several days at a time, he pairs them up with startups from the same sector to help them develop an entrepreneurial mindset. Some of Joao’s assignments often originate from the HR departments of organizations trying to generate a more innovative culture. For one of these assignments, Joao has paired managers from a big bank with entrepreneurs from the fintech sector. The thing is, Christoph, Ces and Joao don’t work for consultancies. They are all co-founders of a branch of Impact Hub. Christoph co-founded Impact Hub Zurich. Ces, the one in Manila, and Joao, the one in São Paulo. 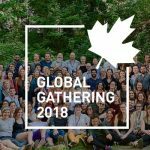 This network, launched in 2005, is made up of over 100 spaces in 50 countries, of which there is one in Montreal since spring 2018. Together, Impact Hubs have 16,000 members. 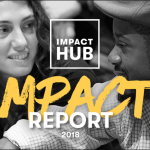 These members are above all entrepreneurs: Impact Hub is both a shared working space and an accelerator, with a strong bent for organizations that generate a positive social impact through their activities. More than 60% of members attribute as much importance to the social and environmental impacts of their projects as to their financial returns. Several of them contribute towards reaching one of the 17 Sustainable Development Goals (SDGs) of the United Nations through their business models. If Impact Hub serves the social entrepreneur community, why do Christoph, Ces and Joao carry out consultancy assignments for the Googles of this world? Because the Impact Hub community also includes some big companies. These relationships often started with sponsorships, a purely pragmatic move by Impact Hub since this was a source of finance. Christoph, Ces, Joao and their counterparts soon discovered big firms’ appetite for innovation and their ensuing search for other channels to obtain it. An appealing employer and staff retention increasingly go hand in hand with a job that has more meaning, which is one of the specialties of impact oriented companies. The big companies are realizing this, which explains why they’re ever more turning towards places like Impact Hub to develop their “employer brand”. The Greenpeace or WWF approach? I’ll finish by sharing the ‘Comanifesto’ of Impact Hub Zurich, that is, the principles guiding what they do. Perhaps you’ll find a spark in there to give your teams, your department or your company some new momentum. Diane Bérard works as a columnist for the French-language bi-monthly newspaper Les Affaires in Montreal and previously headed the magazine Commerce for seven years. She is often invited to comment on economic news in the media. 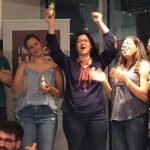 The author of three books in French and a blog, she channels her copious energy into communicating her passion for the world of business and the economy. Her blog Le fil de Diane (‘Diana’s thread’) helps readers navigate the mass of economics-related information available on the Internet (not currently available to EU based readers). Translation from French by Phoebe Blackburn (Impact Hub Berlin Member and co-founding member of sustainability consultancy sustainable natives).